This beautiful small-sized chandelier will become the centerpiece of attraction in any room of your home. Featuring a silver chrome finish, this metal constructed lighting accent can hold up to five lighting bulb in center. With easy expert installation, this will make your space look elegantly glowing. Hang this chandelier on any ceiling and it will enhance the beauty of your home in an interesting way. This chandelier works well with classic furniture and it will also look stunning in a contemporary space. Minor assembly required. 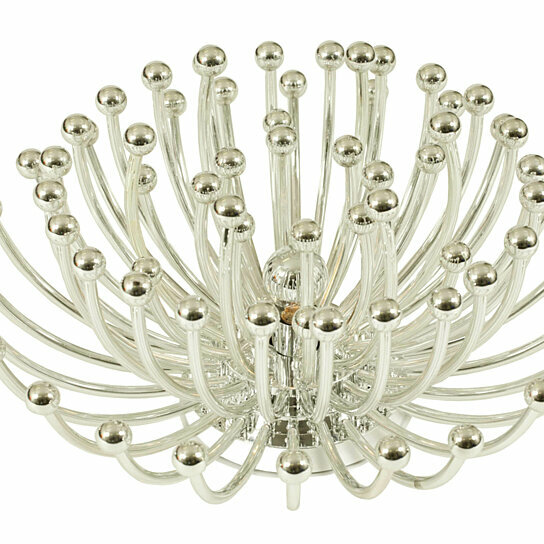 It features crystal accents with silver chrome finish and a bulb in center. Made up of sturdy metal and features a silver chrome finish that provides style and strength all together.